Raumfahrt - Sowjet-Ära Kosmonaut Anatoly Berezovoy (Raumstation Saljut) gestorben. Raumfahrt - NASA´s Rückkehr zur bemannten Raumfahrt der Vereinigten Staaten. The ULA team is proud to launch the CLIO mission on an Atlas V 401, from Space Launch Complex 41, for Lockheed Martin Space Systems Company. The ULA team is focused on attaining Perfect Product Delivery for the CLIO mission, which includes a relentless focus on mission success (the perfect product) and also excellence and continuous improvement in meeting all of the needs of our customers (the perfect delivery). Martin, their U.S. government sponsor, ULA, and major suppliers of ULA. Go Atlas, Go Centaur, Go CLIO! Rocket/Payload: An Atlas V 401 will launch the CLIO mission for the U.S. government. Date/Site/Launch Time: Tuesday, Sept. 16, 2014, from Space Launch Complex-41 at Cape Canaveral Air Force Station, Florida. Launch Notes: The CLIO mission will mark the 49th Atlas V launch and the 25th of the 401 configuration. CLIO also will be the 60th ULA launch from Cape Canaveral and the company’s 11th of 2014. Early forecast shows a 40 percent chance of favorable weather. Mission mangers this morning gave a "go" to proceed toward a 5:44 p.m. Tuesday liftoff of a United Launch Alliance Atlas V rocket and classified U.S. government satellite from Cape Canaveral Air Force Station. An early forecast shows a 40 percent chance of favorable weather during a launch window expected to last more than two hours, with thunderstorms, clouds and even solar flares potential concerns. The outlook is slightly worse on Wednesday, with a 30 percent chance of acceptable weather. The mission called CLIO is described as flying a "commercially-based communications satellite for the U.S. government," built by Lockheed Martin. The mission's purpose has not been divulged and it is not publicly claimed by any agency. The 19-story rocket and payload are scheduled to roll from a processing tower to the Launch Complex 41 pad Monday morning. The rocket will blast off in a "401" configuration, with a four-meter diameter payload fairing, no strap-on solid rocket boosters and a single Centaur upper stage engine. The launch will be the 49th by an Atlas V rocket since its maiden flight in 2002. Since its maiden launch, almost two decades ago, the A2100 bus has provided myriad benefits to a range of commercial and U.S. Government customers, including a flexible payload capacity, greater power, reduced delivery times, and lower overall cost and risk. It first supported the GE-1 satellite, launched atop an Atlas IIA booster from Space Launch Complex (SLC)-36B at Cape Canaveral Air Force Station in September 1996 for GE Americom. Five years later, Luxembourg-based SES acquired GE Americom and the satellite was renamed AMC-1, which it retains to this day. Since then, more than 40 A2100-series satellites have been placed into orbit, and in September 2013 it was reported that Lockheed Martin had accrued more than 400 years of cumulative on-orbit experience with various configurations of the bus. The A2100’s primary customers have emerged overwhelmingly from the commercial telecommunications satellite industry, and it has the capacity to support Ka-band broadband and broadcasting, fixed satellite services at C-band, Ku-band and X-band, high-power Ku-band direct-broadcast, and mobile services using Extremely High Frequency (EHF), Ultra-High Frequency (UHF), L-band, and S-band. Members of Japan’s Broadcasting Satellite System (B-SAT) have utilized the A2100, as has South Korea’s Koreasat-3, Indonesia’s Telkom-1 and Garuda-1, China’s Zhongwei-1, the U.S. EchoStar network, Canada’s Nimiq-1 and Nimiq-2, Luxembourg’s Astra satellites, Sweden’s Sirius-4, Australia’s Jabiru-1, and the Lockheed Martin Intersputnik (LMI)-1 to provide coverage of Russia and China. Additionally, the A2100 bus was employed for Vietnam’s first two satellites, Vinasat-1 and Vinasat-2, launched in April 2008 and May 2012 respectively. Despite an incident of improperly unfurled solar panels and fuel system problems on the 1998-launched EchoStar-4, which caused a partial loss of the mission, together with power issues on Nimiq-2 and Telkom-1, the A2100 has proven exceptionally reliable. Moreover, the bus has supported other payloads for research and military applications. These have included the classified Palladium At Night (PAN) communications satellite, launched in September 2009, the Advanced Extremely High Frequency (AEHF) and Mobile User Objective System (MUOS) networks and members of the Geostationary element of the Space-Based Infrared System (SBIRS). Future customers include at least four Geostationary Operational Environmental Satellites (GOES-R through U), to be delivered into orbit by Atlas V boosters between 2015-2017, as well as the next-generation Global Positioning System (GPS) Block III. Surprisingly for a classified mission, ULA has issued a detailed timeline for the sequence of events which the Atlas V will execute in order to deliver CLIO into orbit on 16 September. The launch vehicle will fly in its “401” configuration, numerically designated to describe a 13-foot-diameter (4-meter) payload fairing, no strap-on rocket boosters, and a single-engine Centaur upper stage. Having flown on 24 previous occasions, from its maiden voyage in August 2002 to last month’s launch of WorldView-3, the 401 has exhibited near-impeccable reliability. Only a single mission, back in June 2007, suffered a premature shutdown of its Centaur, which left the primary payload—a pair of Naval Ocean Surveillance System (NOSS) satellites—in a lower than intended orbit. Previous A2100-class satellites have varied in weight from 4,400 pounds (2,000 kg) to as much as 14,860 pounds (6,740 kg) in the case of MUOS-2. The Atlas V 401 has the potential to deliver a payload weighing up to 21,600 pounds (9,800 kg) into low-Earth orbit and up to 10,470 pounds (4,750 kg) into geostationary transfer orbit, offering another approximate indicator of the size and weight range of the CLIO spacecraft. Tuesday’s launch will be the fifth to originate from the Cape’s SLC-41 in 2014, following hard on the heels of NASA’s latest Tracking and Data Relay Satellite (TDRS-L) in January, the National Reconnaissance Office’s classified NROL-67 and NROL-33 missions in April and May, and last month’s launch of the most recent GPS Block IIF spacecraft. Only one more Atlas V is due to fly from SLC-41 this year, with a 401 scheduled to deliver the GPS IIF-8 mission into orbit in late October. This final mission of 2014 will also mark the 50th total flight by a member of the Atlas V family. According to Patrick Air Force Base meteorologists, weather conditions for Tuesday afternoon are anticipated to be mostly cloudy, with a 60 percent likelihood of rain showers and a 40 percent chance of lightning. With this in mind, ULA announced Friday, 12 September, that there exists only a 40 percent probability of sufficiently acceptable conditions to support an on-time launch. Nevertheless, the Launch Readiness Review (LRR) confirmed on Friday that it would press ahead with efforts to get CLIO into orbit on the first opportunity. At the time of writing, the impending milestone for the 196-foot-tall (60-meter) Atlas V 401 is an approximately 40-minute rollout from the Vertical Integration Facility (VIF) to the SLC-41 pad surface. This will be followed by a flurry of activity to establish pad connections, perform pneumatic and other checks, and verify the integrity of the booster’s flight control systems. The Atlas will undergo extensive testing of its ground commanding and communications equipment, and its fuel lines will be purged with gaseous nitrogen, ahead of the propellant loading protocol. Its first stage burns a mixture of liquid oxygen and a highly refined form of rocket-grade kerosene (known as “RP-1”). About an hour before the opening of Tuesday’s window, the propellant tanks of the first stage will be full and the liquid oxygen tanking will transition to a “topping” mode, undergoing continuous replenishment until close to launch time. Following a final “Go-No Go” poll of all stations, the Launch Director will authorize a formal “Go for Launch” at the last scheduled hold point at T-4 minutes and the terminal count will get underway. Under its auspices, the Atlas V’s autosequencer will assume primary command of all vehicle critical functions through liftoff. Liquid oxygen replenishment will conclude, the fuel and oxidizer valves will be closed for flight, and the propellant tanks will be confirmed to be at their correct Flight Pressures. At T-5 seconds, sound-suppressing water will flood across the SLC-41 pad surface and into the flame trench, in order to minimize reflected energy and acoustic waves at the instant of liftoff. The ignition sequence of the Atlas V’s single, Russian-built RD-180 engine will commence at T-2.7 seconds, punching out 860,000 pounds (390,000 kg) of thrust, and assuming no technical or weather issues the vehicle will be committed to flight at 5:44 p.m. EDT. The rocket, whose thrust-to-weight ratio is only 1:16, will lumber off the pad at T+1.1 seconds and climb vertically for the first 16 seconds of the mission. At this stage, the Centaur avionics will command a pitch, roll, and yaw program maneuver to actively guide the stack onto the proper flight azimuth to insert CLIO into orbit. About four minutes into the flight, the RD-180 engine will be shut down and the 41-foot-long (12.4-meter) Centaur and attached CLIO will be detached from the rapidly ascending vehicle. The next phase of the flight will incorporate two discrete “burns” by the Centaur’s 22,300-pound-thrust (1,100-kg) RL-10A liquid oxygen/hydrogen engine. The first burn will begin at T+4 minutes and 17 seconds and will last for about 13.5 minutes, during which time the two-piece (or “bisector”) Payload Fairing (PLF) will be jettisoned. This will expose the CLIO satellite to the space environment for the first time. Main Engine Cutoff-1 (MECO-1) is timed to occur at T+17 minutes and 58 seconds, after which the Centaur/CLIO stack will “coast” for more than two hours, ahead of the second burn. This is scheduled to get underway at T+2 hours, 47 minutes, and 52 seconds and will be significantly shorter in duration, lasting about 70 seconds. Following MECO-2, the CLIO spacecraft will separate from the vehicle at T+2 hours, 51 minutes, and 52 seconds after leaving Cape Canaveral. “The burn duration suggests that the mission is targeting an elliptical transfer orbit, with an estimated inclination of about 25 degrees,” noted Spaceflight101. “The CLIO launch profile suggests either a Medium Earth Orbit insertion or an injection into a Geostationary Transfer Orbit with increased perigee.” However, it will be difficult to infer CLIO’s purpose—whether for geostationary military communications or a wholly different goal—until the orbit of the satellite is precisely tracked. Tuesday’s launch of CLIO represents the 11th of 14 scheduled flights by ULA in an action-packed 2014. To date, the Centennial, Colo.-based launch services provider—formed in December 2006 between Boeing and Lockheed Martin—has delivered payloads into orbit on behalf of NASA and the U.S. military. Following the CLIO launch, ULA anticipates lofting GPS IIF-8 on 29 October and a classified NRO payload and the long-awaited Exploration Flight Test (EFT)-1 of NASA’s Orion spacecraft in the first half of December. Original plans also envisaged the launch of the Soil Moisture Active Passive (SMAP) satellite in November, although this mission has been postponed until early 2015. 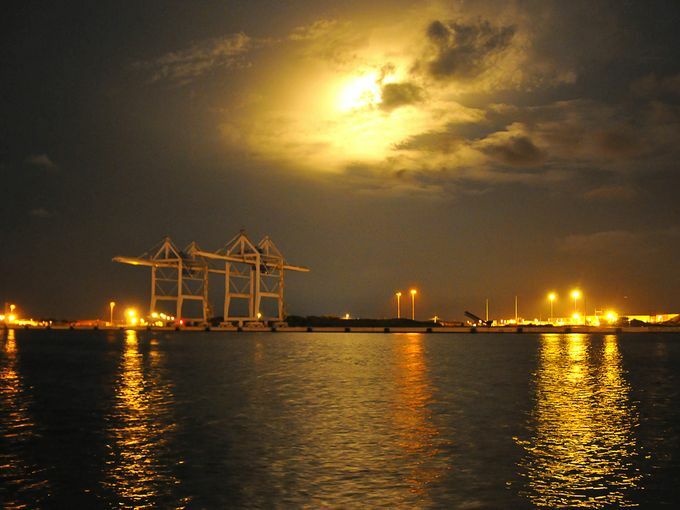 Weather conditions could pose a threat for tonight's Atlas V rocket launch from Brevard County. 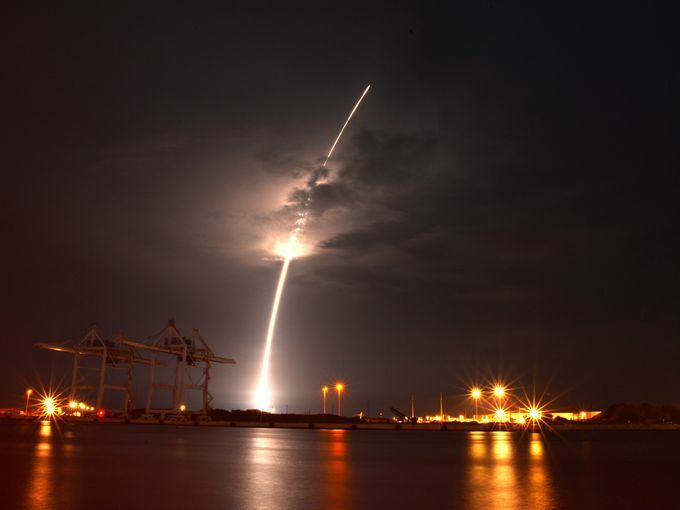 Forecasters said there is a 40 percent chance of favorable conditions during the launch window, which runs from 5:44 p.m. to 8:10 p.m., at Cape Canaveral Air Force Station. The primary concerns of violating weather constraints include anvil clouds, thick clouds and proton flux. 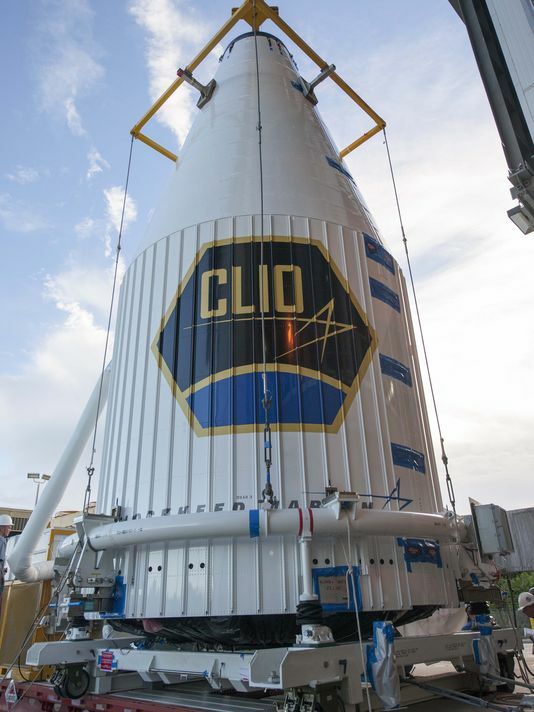 United Launch Alliance's rocket will deliver the CLIO spacecraft for Lockheed Martin. It’s a commercially-based communications satellite for the U.S. government. If the launch is scrubbed, weather conditions worsen to 30 percent for Wednesday's attempt. 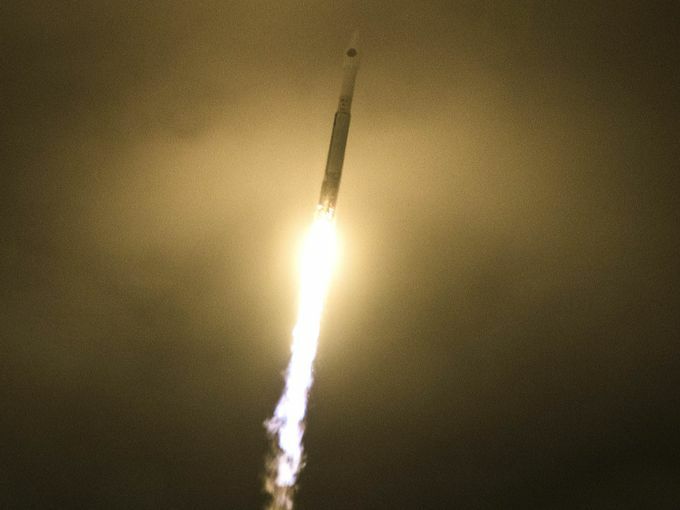 Meanwhile, SpaceX is scheduled to launch its Falcon 9 rocket at 2:16 a.m. Saturday. The Dragon capsule will bring 5,000 pounds of cargo to the International Space Station. Atlas V Lifts Off with CLIOCape Canaveral Air Force Station, Fla., (Sept. 16, 2014) – A United Launch Alliance (ULA) Atlas V rocket carrying the CLIO mission for Lockheed Martin Space Systems Company launched at 8:10 p.m. EDT today from Space Launch Complex-41. 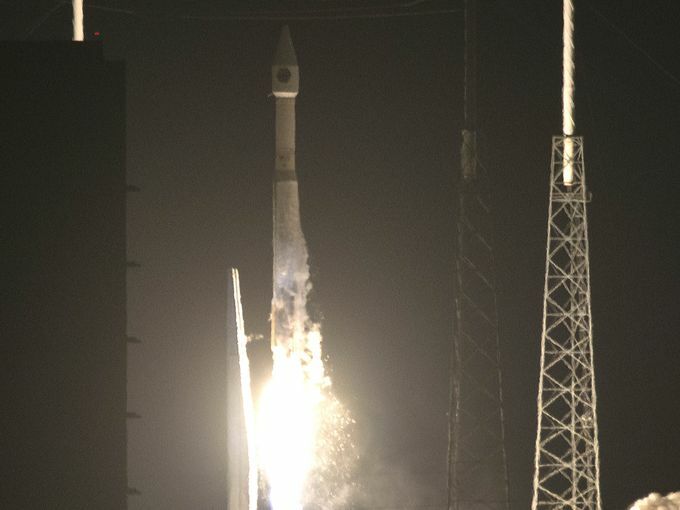 This mission was launched aboard an Atlas V 401 configuration vehicle, which includes a 4-meter-diameter payload fairing. The Atlas booster for this mission was powered by the RD AMROSS RD-180 engine, and the Centaur upper stage was powered by a single Aerojet Rocketdyne RL10A engine. “The ULA, Lockheed Martin, supplier, and government teams seamlessly integrated to ensure accurate delivery of the CLIO mission to orbit,” said Sponnick. ULA's next launch is the Atlas V GPS IIF-8 mission for the United States Air Force scheduled for Oct. 29, from Space Launch Complex-41 at Cape Canaveral Air Force Station, Florida. 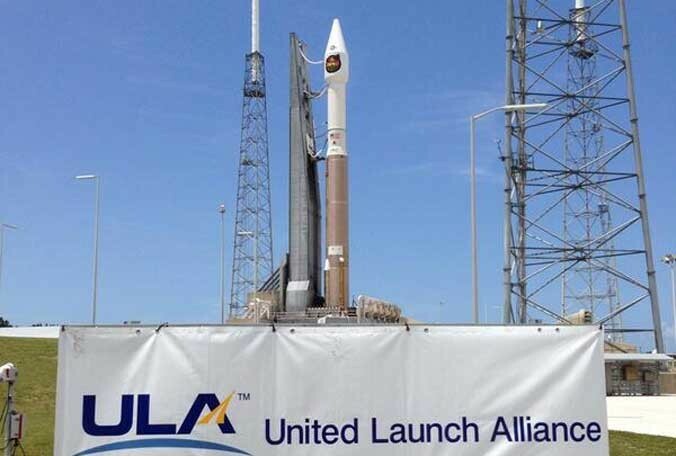 With more than a century of combined heritage, United Launch Alliance is the nation’s most experienced and reliable launch service provider. ULA has successfully delivered more than 85 satellites to orbit that provide critical capabilities for troops in the field, aid meteorologists in tracking severe weather, enable personal device-based GPS navigation and unlock the mysteries of our solar system. ULA – Bringing rocket science down to Earth.